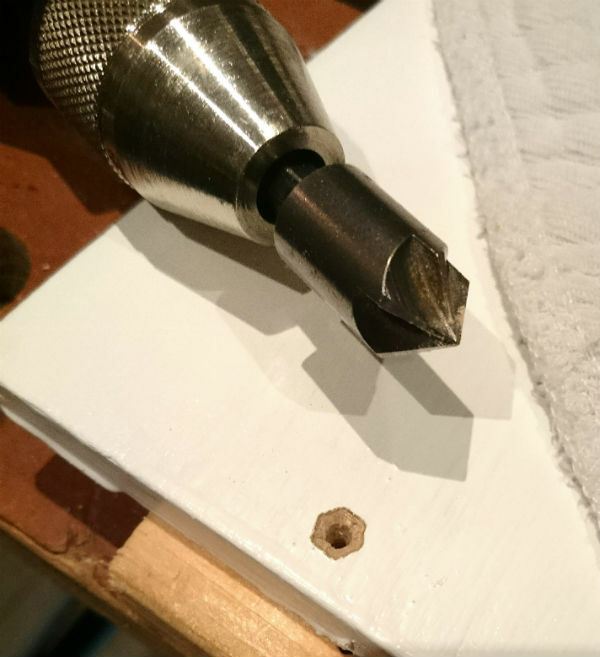 Every time I use my countersink bit, it creates a hexagonal hole. I've tried a hand drill, an electric drill, drilling fast, drilling slow, soft pressure, firm pressure - virtually every time it will create a hexagonal hole. 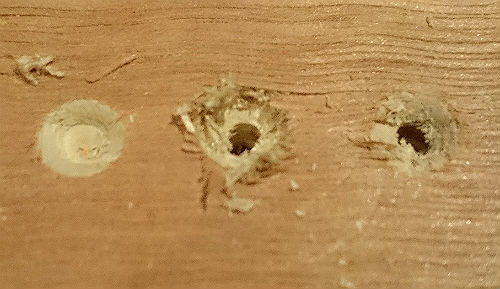 Of the 12 I drilled yesterday, only one was round, and that felt like it was due to that being an abnormally soft area in the wood. Is it the design of the bit? I'm sure the one my dad used when I was a kid had many more vanes. Or is it something I'm doing wrong? Basically, how do I get a circular countersink? Countersinking before drilling the whole is clearly the best, at least for the plywood I'm using. The hand-turned bit could potentially work with a bit more care too; the hole itself is nice and round. Maybe needs a sharper bit. UPDATE: I had to do a couple more last night, but forgot to countersink first; the hand-turned technique worked really well in the painted plywood, although it took care to keep it centred. Is it the design of the bit? Yes I believe that's partly it. But it's almost certainly not the only issue and the main one I think is that it's not sharp enough — this type of countersink rarely is from what I've seen. I have three of what looks like exactly the same countersink and every one of them was not sharp straight from the package, and I have seen many others on sale that appear to be just as (not) sharp. Definitely sharpen the bit if you can manage it as a first step to solving the problem. Sharpening mine did improve performance, although it wasn't an absolute fix. In use the technique that seemed to help the most for me was to run the drill fast and use light pressure, with a very firm hold on the drill. This worked far more reliably than using low speed and firm pressure. Another tip I read just the other day that you might like to try: countersink before you drill the clearance hole. I haven't been in a position to try it myself or I'd report on its effectiveness firsthand but apparently it makes a big difference. That's almost certainly due to the bit chattering. You write that you already tried various speeds, but that's really the solution. Do not run too fast (try half the speed). Apply firm, controlled (but not too brutal, this causes chatter, or locking) press, and keep a steady centered hold as much as possible. Using a drill press if you have one, or a drill rig, will help keeping it centered a lot more easily and more accurately, and applying the correct amount of pressure is a lot easier, too (plus, you have a stopper for nice equal-depth sinks in series). Lacking a drill press or rig, use at least two hands on the machine. No cowboy-style shooting. An electric screwdriver like the one you are using according to the below comment, is a rather bad choice, too. It can make holes, somehow, but it's not really suited for the task. There's people who recommend pressing very, very gently, and going in very slowly (with a moderate to high drill speed), too. I'm not a big fan of that, although it "works" for the problem. You however create a lot of friction by rubbing and scrubbing slowly, which needlessly wears down the tool and may leave burn marks. Unless the tool is blunt (and in that case, throw it away!) there is no reason to rub and scrub in slowly. It's a cutting tool intended for cutting. In wood I tend to get better results with a non-powered countersink tool, not even a wheel brace (the hand drill you mention in another comment). 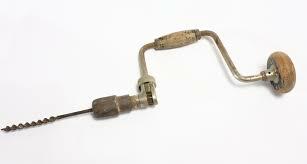 I can't find a suitably-licensed image online, but here's a picture of a dedicated tool. You can do the same by using your bit in a non-ratchet screwdriver handle. Don't push too hard. For small holes (up to say a 6mm screw) in softwood/chip/mdf etc. it's quick -- depending on the job, quicker than swapping bits all the time. I believe your countersink has 5 flutes. If that's the case, then what's happening is the bit is wandering in a circular pattern, the drill is not being held steady enough, or has significant runout/wobble in the chuck or bit. This process, when controlled and performed intentionally, can be used to drill square holes or any regular polygon by using a bit with one flute less than the number of sides of the polygon. As you have discovered, this process doesn't always require control and intention. In your case it's happening because the bit isn't exactly centered on the existing hole in the wood, and is catching on one flute before the other flutes engage the wood. This results in moving the drill and drill bit the opposite direction, until another flute engages, and it proceeds in that fashion, creating the hexagon. Use a countersink with a pilot bit, which will make sure the countersink doesn't wobble once it engages the workpiece. Use a higher speed, which again should cut rather than catch. Clamp the work piece rather than hand holding. Go very slowly, particularly when first engaging the work piece. Don't rely on the bit to self center - make sure you are drilling in the exact center of the hole before the bit engages the wood. A combination of these should resolve your problem. Alternately, embrace the uniqueness of this technique, and make it an intentional part of the work. I agree with Damon, that has to do with chatter, the drill is actually moving up and down to allow such a thing to happen. Now why? Two things come to mind. The first is much less likely but I thought I'd point it out, I've seen a least one bit that you ran the drill 'backwards' for the countersink to cut correctly. This will cause the same issue as the other one. If it is really dull countersink it will chatter no matter how strong you are. (a backwards one is using the dull side so works the same). So I would recommend either sharpening it or getting a new one. I just did a little search and counter sinks, and I think I need to invest a little on some of the nice one that will drill my hole and counter sink in one go! Anyway you can get them really cheap or pay some decent money for them. Edt: after seeing you have an electric 'screwdriver' not a drill, I would say this is allowing the chatter. Those really are not designed well for this type of application. You don't need a cordless drill to do this, allowing for a much cheaper corded drill to be added to your tool set. As another note, a hand drill with a large sharp bit could be used to round them out after you have them close, which might be cheaper yet. The reason you are getting the best results before you predrill is because your countersink does not have a pilot bit of its own to keep it centered. It is relying on The point of the cone to hold it in the hole. the same problem would happen even if you had a pilot bit but the predrilled hole was much larger than the pilot (more than 1/16). Also I would guess that the material you are using is especially susceptible to this problem. Instead of predrilling the hole, make a small indent with a nail (or a tool specifically for this which I cannot remember the name for), in order to hold the bit you have in the right position. Sharp bit matters as well. Then drill out the hole. You should be able to do either with a hand power drill. I work almost exclusively with cordless battery power drills and impacts and have no issues. Also the more I've thought of it, material being used really affects how the speed and pressure I would use. A hard wood will offer more resistance and will not do what you have seen so easily. Bring the drill up to speed and then apply pressure. 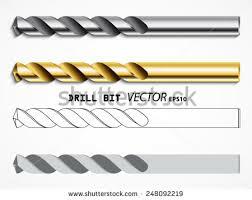 A soft material, which I believe you were using in the photo, will easily drill poorly. If using #2 then go slowly. This is why I suggest #1 first for it will more consistently and quickly result in a good product. Not the answer you're looking for? Browse other questions tagged drilling drill-bits or ask your own question. Best method for drilling thousands of holes? Drilling a straight, centered hole down square-cross-section bar stock?